Norman Armbrust, a local World War II veteran, passed away Wednesday at the age of 96. Editor’s Note: To honor the memory of Norman A. Armbrust, a World War II veteran who died Wednesday at the age of 96, we are republishing an article featuring Armbrust, written by Gary Brock, the editor of Rural Life Today. The article originally published in July 2013. Also, see Page 2 for Armbrust’s full obituary. The four Wright Cyclone engines strained to lift more than 25 tons of Flying Fortress from the airstrip. At the helm of the 10-man crew of the B-17 bomber was Flight Officer Norman Armbrust, a 24-year-old airman from Washington Court House. The huge aircraft lifted into the sky over Thurleigh Airfield in southern England bound for Hanover, Germany. It was July 26, 1943. It was Armbrust’s 12th mission. It was a mission that would take him 70 years to complete…. Armbrust sat in the B-17 as its four Wright Cyclone engines lifted it easily into the air. He had a broad smile on his face. It was July 12, 2013, almost 70 years to the day from his last takeoff. It was the first time he had flown in a B-17 since that fateful day over the skies of Hanover. Armbrust, now 93 years old, was not flying the huge Flying Fortress this time. He sat behind pilots Ray Sowler and Dave Lyons in the plane’s cockpit. As it taxied for takeoff, Armbrust couldn’t help giving the young pilots some advice on their takeoff procedures. Both pilots grinned ear-to-ear in appreciation. The two young pilots knew they were in the company of someone very rare – a real World War II B-17 combat veteran. The restored B-17 “Memphis Belle” that had been used in the film “Memphis Belle” was at Bolton Field near Columbus as part of The Liberty Foundation’s 2013 Salute to Veterans Tour across the country. The tour was in celebration of the Memphis Belle’s historic last mission, also 70 years ago in May, 1943. It was ironic that Armburst’s last combat mission, his 12th, was not the one he was worried about. After all, his 11th mission to bomb a factory in Norway has seen his bomber pelted with more than 300 bullet and shrapnel holes. And they had come back from that mission without a scratch. Except for the bomber, of course, which had to be grounded for repairs. “I wasn’t at all worried about the 12th mission. I was worried about the next one – number 13. Everybody sweats out their 13th mission because it is such bad luck,” Armbrust said, laughing. So for the 12th mission, a July 26th daylight raid against factories in Hanover, Armbrust and his crew was assigned a backup B-17 called “Unbearable II” while their bomber was being made airworthy. “I never thought about why that backup plane was called ‘Unbearable II’…not at the time,” he said. Normally, a WWII bomber was named after another bomber and given the “II” designation only because the first one had been shot down. Hanover was to be an easy, relatively speaking, eight-hour turnaround bomb run. “We were the wingman to the lead bomber, and that also is the best position to be in to make it back,” Armbrust remembered. The lead plane’s superchargers developed problems so to keep up engine speed, the planes had to descend a thousand feet. “There it is alright. There it is,”Armbrust said as he watched the Memphis Belle turn and come in for a landing at Bolton Field Airport. When he arrived at the airport Friday afternoon, the B-17 had taken the first group of journalists and WWII veterans on their “media flight” over the Columbus area. Armbrust was the guest of the Liberty Foundation and the Record-Herald for this special flight in the Flying Fortress. A week earlier, the Foundation had contacted the Record-Herald and offered two seats on a Memphis Belle “preview flight” for the media before the public got a chance to see and ride in the historic aircraft. Rather than two journalists, The Record-Herald asked Foundation representative Scott Maher if it would be OK to have an actual WWII B-17 pilot – Norman Armbrust – along instead of a reporter. Maher said the group would be honored. “We were thrilled to have Mr. Armbrust fly with us. It was a great honor to have him join us,” he said later. Armbrust knew his bomber was in serious trouble. He had been promoted to pilot of his own B-17 just six months before in January, 1943. “When I enlisted, I had been told that the Air Corps did not like to take men who already were experienced flyers before the war. They wanted to train their pilots themselves,” Armbrust said. In combat, Flight Officer Armbrust had proven to be an excellent pilot. That’s because when he was young, he and his brother had gone together and bought a used WWI era Waco biplane for $400 and learned to fly. 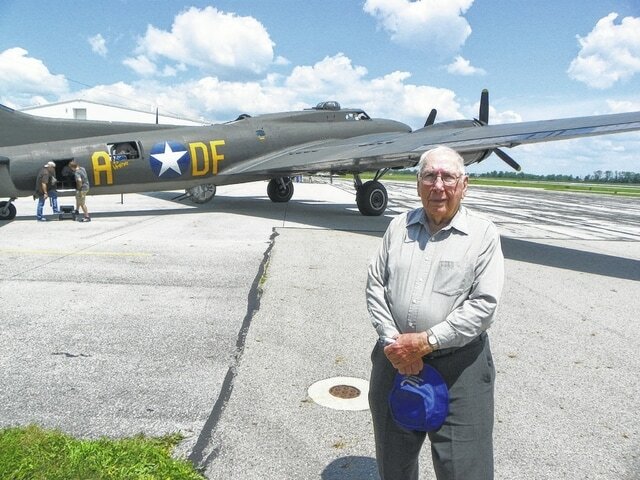 Armbrust watched as the “Memphis Belle” B-17 touched down smoothly on the Bolton runway. His first question to one of the Liberty Foundation ground crew was simple: “Who do they have flying these planes now? Commercial pilots?” He commended the men who were flying this plane for their skills. The bomber’s four engines showed as it taxied close to the awaiting journalists from across central Ohio. When it stopped, a side door opened and the first group of passengers – TV crews, reporters and several WWII veterans, poured out. All seemed thrilled by their experience, smiling and chatting about their flight. Once the first group had completed their interviews, talked to the vets who had just flown – among them a B-17 navigator and another pilot – the Liberty Foundation ground crew moved everyone aside to make way for the second group to the Memphis Belle. “Oh I know,” Armbrust replied, “I’ve done this before.” And with that, he entered the B-17 near the waist gun window. Once inside he paused and laughed. “Yeah… it sure looks smaller.” A crewman led the way to the front. Inside the bomber, it was much smaller than what it appears in movies and on TV. Despite the narrow opening over the bomb bay doors and a three-inch catwalk, Armbrust made his way to the cockpit with ease. He knew exactly where he was going. Reaching the front, pilots Sowler and Lyons introduced themselves. “We are so honored to have you aboard, sir,” Sowell told Armbrust. “Oh, I am real happy to be here.” Behind the pilots seats were two jump seats facing the back. As the four huge Wright Cyclone engines began to reve to takeoff speed, Armbrust turned and looked at the instrument panel of the B-17. He could see it clearly between the two pilots. That was when all the memories began to flood back, and Armbrust returned to that day in July, 1943. “After the flak hit us and we lost all our airspeed, we started losing our engines,” Armbrust said. In 1943, the massive B-17 raids by the Eighth Air Force were controversial back in Washington and among the military leaders. These planes flew without fighter support because no American fighter planes at that time had the range to stay with the big bombers all the way to the target. Once the fighters who were on hand had to turn back to England, the FW-190s and ME- 109s pounced on the formations. The bombers were well armed with 13 machine guns, and they flew in a tight formation to increase their fire power. In those first months of the air war, American bomber casualties were staggering. So many planes were lost that in fact, Commanding General Dwight Eisenhower considered ordering the raids to stop, or at least to change to the night-time bombing done by the British Air Corps with their big Lancaster bombers. But Eisenhower also knew that while British losses were less, their bombing accuracy at night was also less effective. So the daylight raids continued, and pilots like Armbrust continued to fly into the face of Hell over Germany. “Of the 36 B-17s that started out with us in the 306 Bomb Group, only three finished their tour. Only three,” Armbrust remembered. When the Unbearable II started losing its engines, and his bomber began to descend and slow, Armbrust tried to nurse it out of Germany using every flight trick he knew. “But the engines went one after the other,” he said. Finally, with just one engine holding the Flying Fortress in the air (remember, it no longer had its bomb load or about half its fuel) Armbrust managed to get about a third of the way out of Germany. Armbrust smiled as the Memphis Belle lifted off the runway. “Good takeoff,” he said, and began asking the two pilots a variety of questions about their flying background, how they were flying the plane, and if they were following his “1943-style” checklist. “It’s right here,” said co-pilot Lyons, showing Armbrust the “2013-style” laminated checklist hanging around his neck. “I’m just having fun with these guys,” he said. He didn’t hesitate to admit the flight was bringing back a lot of memories from his days in the cockpit. Other media came to the front of the plane, taking pictures and asking Armbrust questions about his years of service, and especially about his feelings now that he was back in the air. “Oh, yeah, I’m having a great time,” he told the reporters. But not all his memories were good ones. Bullets were ripping through the fuselage of the Unbearable II, tearing it apart. “We were down to one engine. It was on fire. We were bailing out and falling. And this German fighter decided to strafe us!” he said. As he moved back to the bomb bay doors to jump out, he felt a crease on his arm. A bullet from the JU-88 had touched the fabric of his jacket. “He didn’t hit anyone, even with all that shooting. We all jumped out OK,” Armbrust said. He had never bailed out of a plane, but didn’t hesitate to jump. “Jumping was easy. I didn’t have any choice,” he said. Armbrust delayed pulling the ripcord as long as he could. “Sometimes the Germans would fire at the chutes.” He waited as long as he dared and pulled the cord hard and the chute opened. But when he hit the ground in the woods below, Germans were waiting for him. “I got up from the ground and was staring at this German’s Luger,” he said. After he was captured, he and his crew were sent to Stalag Fuft 3A – where the famous “Great Escape” took place. Of the three crewman injured, two survived, but the ball turret gunner died in a German hospital of his shrapnel wounds. After the war, Armbrust visited his family in Northern Ohio. He spent almost two years in captivity, and was liberated by advancing American troops in May, 1945. Armbrust had returned to his old air base where mission 12 started, but there was still one piece of unfinished business. Inside the Memphis Belle, Armbrust talked to the two pilots as they flew over Columbus, then dipped a wing and circled back to Grove City and Bolton. The pilots had been told of Armbrust’s tour of duty in WWII, his missions and his final flight, as well as his years in captivity. Before anyone was ready for the flight to end, the Memphis Belle prepared to land. Armbrust and the other passengers put their seatbelts back on, and the bomber touched down as smoothly as it had taken off. Pilot Sowler turned to Armbrust as the plane taxied to a stop. “I understand you had trouble on your last mission and you had to bail out. So I guess we’re helping you complete that last mission today,” he said with a big smile. “Yeah, I guess so,” Armbrust said. Everyone else had gotten out of the Memphis Belle and Armbrust paused at the entrance of the hatch. Those awaiting him on the tarmac stopped and waited to see him exit the B-17. He stepped out onto the small ladder with the help of the ground crew, and he smiled from ear to ear as he touched solid ground. https://www.recordherald.com/wp-content/uploads/sites/27/2016/08/web1_101_0901.jpgNorman Armbrust, a local World War II veteran, passed away Wednesday at the age of 96.